Once you have decided to relocate to Manila, you have to be ready to embrace the city’s busy streets and fast-paced life. You not only have to secure valid documents such as visas and permits for yourself but also for your dependents. Many expats find their way to Manila to seek employment opportunities. However, finding a job in Manila can tough because, under the Philippine labour law, a company can only hire an expat if they can present proof that the number of locals is not enough to fill the role. Good news is, culture shock and language barrier are the least of your problems once you arrive. Historically-speaking, the nation has always been a magnet to foreigners and the Filipinos are heavily exposed to Chinese, Japanese, Spanish and American pop cultures. The locals are very fluent when it comes to speaking English, which is considered to be the nation’s second language. Being able to learn the so-called ‘universal language’ at an affordable cost is also the reason why many international students go there. 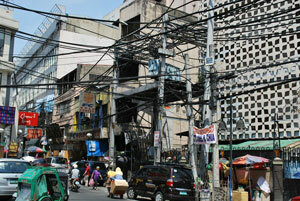 Overall, expats moving to Manila can expect a highly diverse and multi-cultural environment. Pets entering Manila should have a microchip as a form of identification. Owners should be able to secure the animal’s health certificate issued by a licensed veterinarian and bears the stamp of the Ministry of Foreign Affairs from your home country 30 days before arrival in Manila. You also need to present the Health Certificate to any Philippine Consular Office three weeks before the shipment of your pet to obtain a Certification of Authenticity. The pet should also have a valid Import Permit that you can file in two different ways: direct application to the Bureau of Animal Industry (BAI) or by presenting the animal’s Health Certificate to a Quarantine Officer upon entering Manila. The fee for the Import Permit costs Php 200.00 or roughly €10.00. Several types of visas are required when entering the Manila. The Bureau of Immigration is the government agency that issues visas to foreign nationals. Whether you will only visit for a short period or on an assignment for a few years, it is important that you learn about the different visa categories.